The city is located in the basin named after Tapolca. 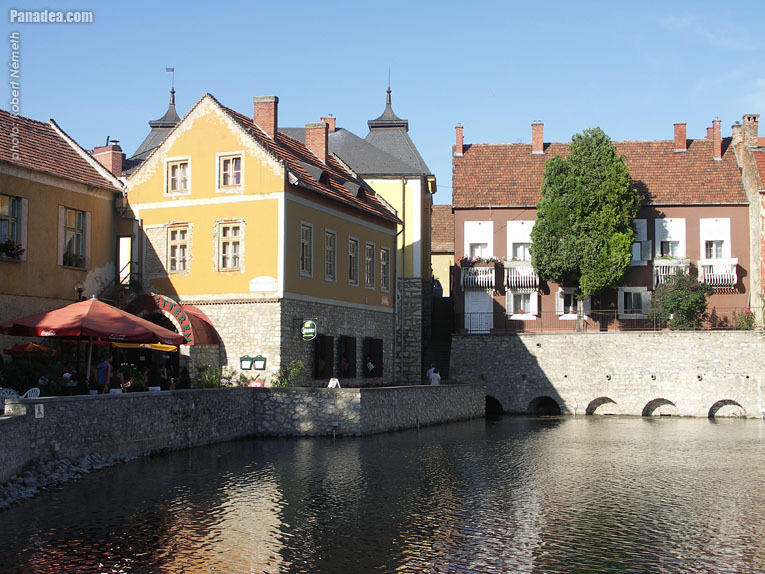 It is surrounded with basalt mountains and it is also the capital of the Balaton Uplands (Balaton-felvidék). The city has been inhabited since the New Stone Age, because of the hot water springs and the roads going through the area. 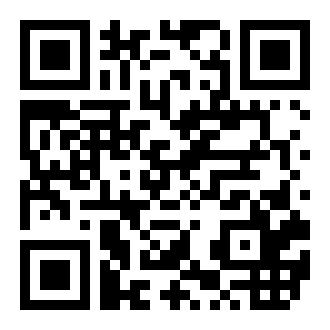 Its marvellous cave can be toured by boat, the experience is compelling. Furthermore visitors can enjoy the atmosphere of the historic Tapolca with the help of the small old houses around Lake Malom. Its name was given by Slavs; in the 12th century recordings used the name of Tapulza, which means thermal waters. In the 13th century Andrew II presented the city to overseer Turul who established his seat on Templom Hill. At this time the city was called Turultapolca. Later Louis I the Great gifted it to the Karthausian monastery of Lövölde, and eventually in the 16th century the Turks destroyed it. Little by little the city was inhabited again and in the 19th century became the centre of the surrounding wine industry. In 1902 during the digging of a well for a house it was discovered that under the site, in the limestone rock, a cave had formed because of the effects of karst water. Ten years after its discovery the cave was opened to the public. The temperature of the water is 19 °C; the air is between 14 and 16 °C, which is perfect for treating respiratory diseases due to its composition. The cave can be divided into two parts; one of them is the dry cave, one of the rooms of which is called Lóczy Room. The small hemispherical niches, the results of the forming effect of water, can be observed on the walls and ceiling of the twenty metres long and six to eight metres high room. The other part is the Lake Cave where you can wander by boat and you can even encounter underwater corridors. The unique view of Lake Malom and its surroundings surprise visitors who enter this inner garden through a gate from the Main Square. 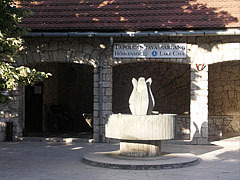 The hot springs, from which the city gets its name, are located here. They were dammed up in order to operate the mill. 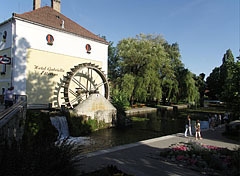 Tapolca Stream runs a two hundred year old water mill. 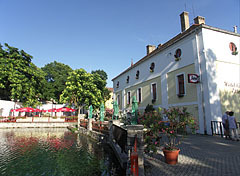 The shores of the lake are decorated with colourful houses and its water is full of large goldfish. In the garden visitors can see the statue ‘Kis királyfi’ (Little prince) made by László Márton; it shows the figure sitting on a handrail and looking at the lake. This statue is a reproduction of the one on the promenade of the Danube in Pest. Here he is sitting with his back turned to the river. Another reproduction can be found in Tokyo. 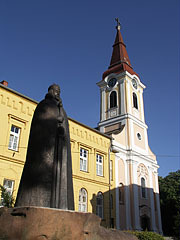 The Roman Catholic Church on the hill was built by overseer Turul at the beginning of the 13th century. It was reconstructed in Gothic style and later, in the 18th century it was extended in Baroque. On the wall of the Gothic sanctuary the remains of a 15th century fresco can be seen. A ruin garden is situated next to the church, where the remains of a Roman estate centre and overseer Turul’s mansion are exhibited. The mansion was transformed into a fortified palace in the 15th century by the Karthausians. Located on the hill is The School Museum, where you can see the rooms of the schoolmaster and cantor together with a school history exhibition. 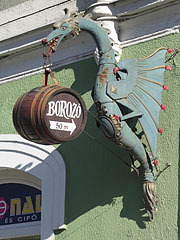 Walking in the direction of the Main Square from Lake Malom, at the exit the shop sign refers to the significance of the city in wine production: a dragon is holding a barrel on his tongue. The square used to serve as a place for markets and fairs; so it used to be the centre of commerce. There is a Holy Trinity column on the square as well, it was built in the 18th century and invites tourists with benches and flowers to have a rest.